Amy Waltz's red brass cuff is an elegant reminder to rise up and keep climbing. When Amy Waltz set out to create a line of empowering jewelry for women, she knew she had to include a mountain range in her designs. For Amy, mountains are symbols of adventure, climbing spiritually and mentally, and continual self love and improvement—so she created a cuff that encourages you to "rise up" each time you look at your wrist. 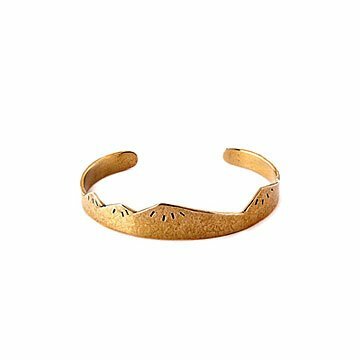 The bracelet is made of rolled red brass, so every hand-cut peak and valley has depth and texture. It even features delicate imprints representing snow—challenging terrain along the way—as an elegant reminder that the climb isn't always easy, but it's always worth it. Handmade in California. Each piece of Amy Waltz’s jewelry is handcrafted in the US by women who love what they do, using recycled, non-conflict metals and stones. She hopes her jewelry will inspire you to "think more positively, treat yourself and others gentler, and open yourself up to the sun on your face and the wind in your hair."